Anglo-Scottish socialite, author and wit; born Emma Alice Margaret Tennant; second wife of Herbert Henry Asquith. 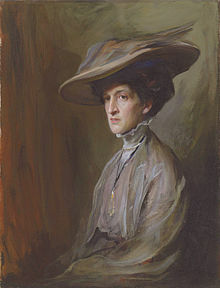 "Mrs. Asquith", a biographical portrait by John McLure Hamilton from Men I Have Painted (1921). This page was last edited on 30 June 2018, at 15:13.